GIG HARBOR – It’s an hour before the Washington Corrections Center for Women closes for the night. The courtyard is quiet compared to the hustle and bustle during the day. A group of volunteers from Chapel Hill Presbyterian Church, dressed in Santa hats and light up necklaces, walk through the cold winter air. Clasped in their hands are copies of sheet music and sticks with clusters of shiny jingle bells. They make their way inside the dining hall that is beaming with life and idle chatter. As they enter the room, the conversations slowly fade as the curiosity grows of who the visitors are. The group lines up in a semi-circle and begins to sing Rudolph the Red Nosed Reindeer. 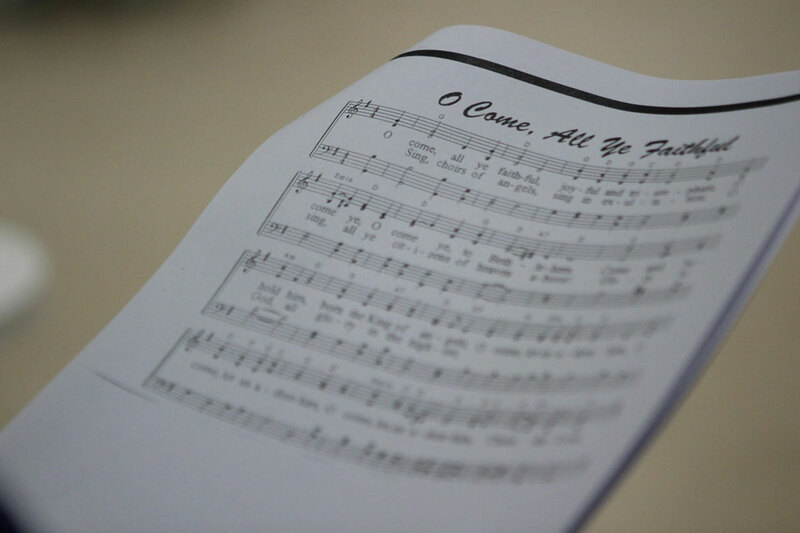 The tradition of singing Christmas carols at the women’s facility has become an eagerly anticipated tradition for the singers as well as the listeners. DeLaney, 80, is a retired teacher from Gig Harbor. She’s been a regular volunteer at the facility for more than 19 years. In addition to organizing the caroling event, she helps run the prison’s clothing closet, which gives donated clothes to women releasing from prison. Delaney has also volunteered as a math tutor in the prison’s Trades-Related Apprenticeship Coaching (TRAC)(pdf) vocational program. Additionally, she sets up activities for incarcerated mothers and their children during family visits. 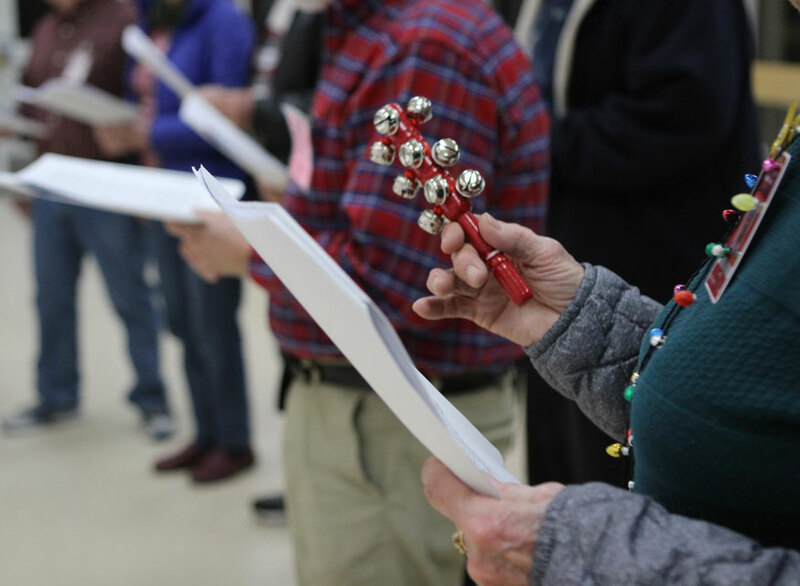 Six years ago, the correctional facility called DeLaney and asked if she could organize a group of carolers to come to the facility to sing for the inmates during the holidays. The initial event was so well received, DeLaney continued the event ever since. 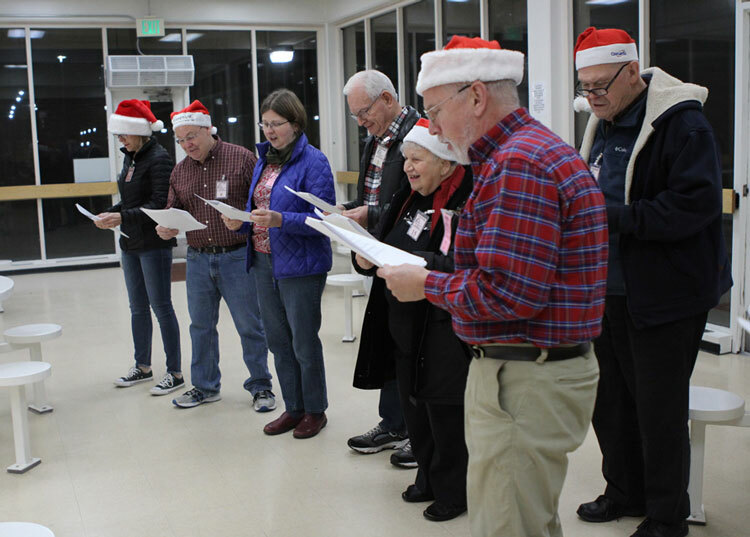 Each year approximately 30 carolers come to the facility. DeLaney provides sheet music for the group. None of the songs are rehearsed before the event. 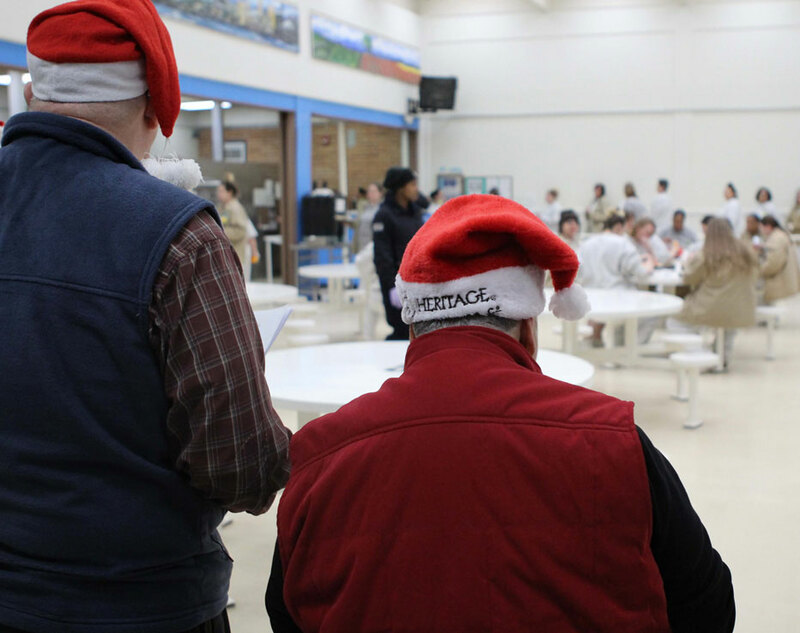 The carolers encourage the incarcerated women to sing along with the songs they know. The song list includes classics like Rudolph, Frosty the Snowman, O Holy Night, Here Comes Santa Claus, Jingle Bells, Away in a Manger, Silent Night, Santa Claus is Coming to Town, O Come All Ye Faithful, Deck the Halls, O Little Town of Bethlehem, and We Wish You a Merry Christmas. “Not all of us sing very well, but our hearts and spirits are in it even if our voices are a little lacking,” DeLaney said. In past years, the carolers split into two groups, walked to different units and met in the middle courtyard at the end. However, this year the singers decided to try something different. Each group went to one of the two dining halls and sang as the women came for their meal time. 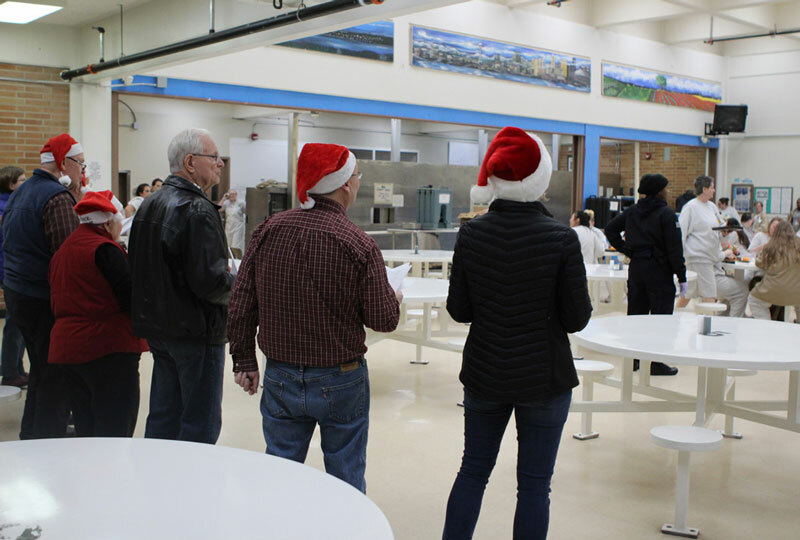 Despite the room being filled with sounds of trays being cleared and inmates eating, the women cheered after every song and some even joined in for a song or two. Joyful music and laughter could be heard throughout the performance. Carolers said the open space allowed them to interact with the women more easily. They were even able to take requests to sing certain songs. It also allowed the women to thank the volunteers and wish them well as they finished their meals and headed back to their cells. “It’s just hoping we bring smiles to the women’s faces, that’s all we want to do,” Delaney said. Events that provide the opportunity to interact with the community in a positive way can lead to a smoother transition to reentry and help the department in its mission to improve public safety. 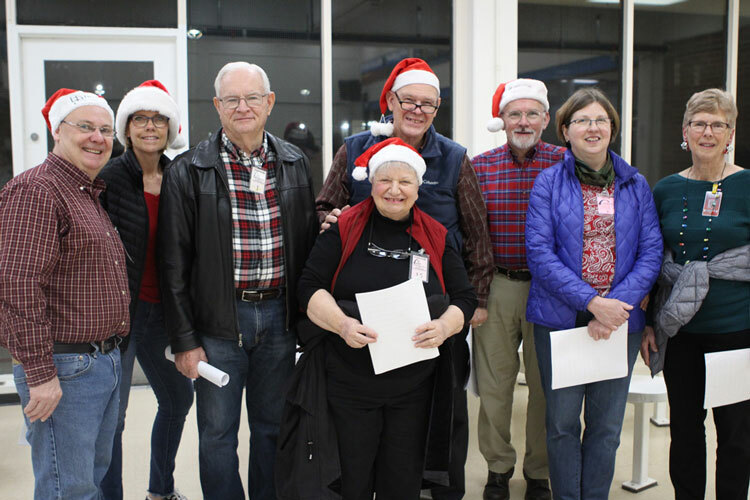 Many of the carolers plan to continue to participate in the event in the years to come, and hope that each year they can make someone’s season just a little brighter.